Managing Buildings for Good IAQ 31 5 Managing Buildings for Good IAQ ■ keep interior of equipment and ductwork clean and dry Oversee activities of staff, tenants, contrac- tors, and other building occupants that impact indoor air quality ■ smoking ■ housekeeping ■ building maintenance ■ shipping and receiving ■ pest control ■ food preparation and other special uses Maintain communications with occupants so that management will be informed of complaints about the indoor environment in a timely way ■ identify building management and staff with IAQ responsibilities ■ use health and safety committees Educate staff, occupants, and contractors about their responsibilities in relation to indoor air quality ■ staff training ■ lease arrangements ■ contracts Identify aspects of planned projects that could affect indoor air quality and manage projects so that good air quality is maintained ■ redecorating, renovation, or remodeling ■ relocation of personnel or functions within the building ■ new construction DEVELOPING AN IAQ MANAGEMENT PLAN The chart on page 32 shows the elements of an IAQ management plan. 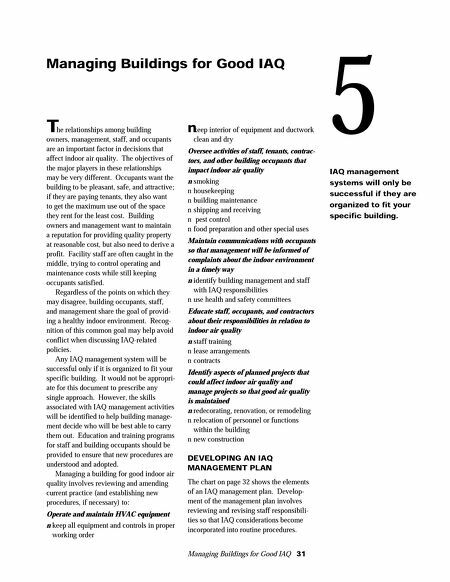 Develop- ment of the management plan involves reviewing and revising staff responsibili- ties so that IAQ considerations become incorporated into routine procedures. The relationships among building owners, management, staff, and occupants are an important factor in decisions that affect indoor air quality. The objectives of the major players in these relationships may be very different. Occupants want the building to be pleasant, safe, and attractive; if they are paying tenants, they also want to get the maximum use out of the space they rent for the least cost. Building owners and management want to maintain a reputation for providing quality property at reasonable cost, but also need to derive a profit. Facility staff are often caught in the middle, trying to control operating and maintenance costs while still keeping occupants satisfied. Regardless of the points on which they may disagree, building occupants, staff, and management share the goal of provid- ing a healthy indoor environment. Recog- nition of this common goal may help avoid conflict when discussing IAQ-related policies. 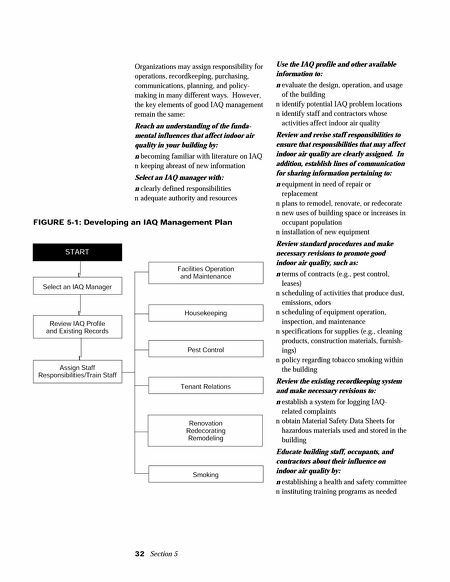 Any IAQ management system will be successful only if it is organized to fit your specific building. It would not be appropri- ate for this document to prescribe any single approach. However, the skills associated with IAQ management activities will be identified to help building manage- ment decide who will be best able to carry them out. Education and training programs for staff and building occupants should be provided to ensure that new procedures are understood and adopted. Managing a building for good indoor air quality involves reviewing and amending current practice (and establishing new procedures, if necessary) to: Operate and maintain HVAC equipment ■ keep all equipment and controls in proper working order IAQ management systems will only be successful if they are organized to fit your specific building.